The Sting is among the best, if not the best, con-artists’ films ever made. It was directed by George Roy Hill to a screenplay written by David S. Ward. The story itself, though fictional, was inspired by David Maurer’s book The Big Con: The Story of the Confidence Man. In the book, which details stories of various grifters, The Sting is based on the real-life cons carried out by the Gondorff brothers, Fred and Charley. If you have never seen it, or it had been a while since you did, check it out. The Sting is available for streaming on Netflix. Think of The Wolf of Wall Street as The Great Gatsby meeting The Goodfellas of the stock market. Martin Scorsese's drama-comedy-biopic is based on Jordan Belfort's real-life memoir of the same name. The Wolf of Wall Street has several great moments but, all in all, when everything is said and done, I had to ask myself whether there was really a need to make this film. At close to three hours the film is long and feels even longer. Having Belfort as the film’s protagonist, even if the lead is depicted by a charismatic DiCaprio, makes the story dislikable and somewhat dull. That being said, maybe for the Kardashians audience this film is a treat. Not being part of that crowd, this film is one I could have done without. American Hustle is a comedy-drama film, directed by David O. Russell to a screenplay by Eric Warren Singer and Russell himself. It is inspired by the FBI ABSCAM operation, which took place in the late 1970s and early 1980s. The film stars a terrific ensemble, including Christian Bale, Bradley Cooper, Amy Adams, Jeremy Renner, Louis C.K. and Jennifer Lawrence. 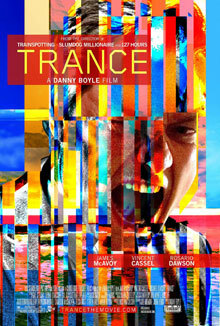 Trance's main challenge is its storyline, followed by some issues of credibility. Nevertheless, the film manages to remain gripping for portions of time, providing entertainment value. Despite giving Side Effects 4-star rating, this film is a miss. It starts as an intriguing drama, addressing issues of ethics related to the use of medications, but midway through, it drops reality behind as the plot turns into a thriller. With the above said, Side Effects is still an outstanding film. It is highly engaging, wonderfully acted -- especially by its convincing two leads Jude Law and Rooney Mara.